We’re Making it E.Z. to Enjoy Lakes Park with Complimentary Courtesy In-Park Transportation! 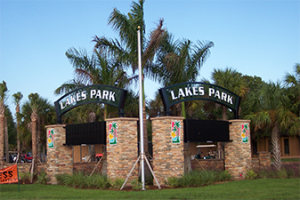 At the Lakes Park Enrichment Foundation, we believe that everyone should benefit from the beauty and fun at Lakes Park, which is why we created and are funding the E.Z. Rider Lakes Park Assisted Tour Service! The E.Z. Rider is a six-passenger golf cart available to guests of Lakes Park by reservation which transports individuals and families who could not otherwise enjoy the park. 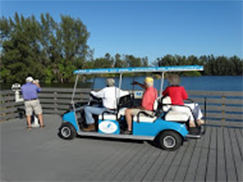 Your group will be taken on a 1- 1 ½ hour park tour by a Lee County Parks & Recreation Certified Volunteer, with tour commentary customized to the passengers specific interests! Guests of the E.Z. Rider can see many aspects of the park with their friends and family in a convenient and safe way! The E.Z. Rider allows park-goers with reduced mobility who may or may not be physically disabled, in a wheelchair, or who need assistance walking, to enjoy Lakes Park. The E.Z. Rider is a great experience for the elderly or visitors with medical conditions that limit physical activity and prohibit excessive heat. 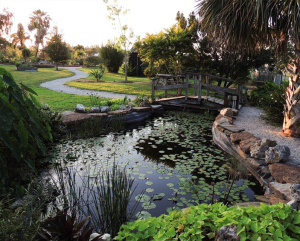 The tour at Lakes Park can positively impact your elderly loved one by helping them get some fresh air, enjoy the scenery of the Botanic Garden, or bird watch. While the E.Z. Rider is typically for those who wouldn’t be able to enjoy the span of the park without assistance, reservations are available for all park guests. For more information and to reserve the E.Z. Rider, call 239-533-7575 ext. 5. Plant sale at the Lakes Park Fragrance Garden!